The many picturesque towns just west and north of the Cape Cod Canal and Buzzards Bay offer a charm all their own. Steeped in history, many of these towns were settled by descendants of the original Pilgrims who landed in Plymouth in 1620. Offering beaches, boating, shopping, fine dining and special summer events, any of these destinations will provide you with plenty to do and see during your vacation. Ellisville is one of Plymouth's oldest fishing villages. Much of the village is set aside for a state park and there are extensive salt marshes, which preserve the serene beauty of this quiet little town. There is an ocean beach on Cape Cod Bay and tranquil Swan Pond, which hosts varied waterfowl. Ellisville Harbor State Park is a unique coastal property, including an 18th century farmstead (the park was once part of the Harlow family farmstead), beachfront, salt marsh, rolling meadows, and red pine forest. It's also one of the most scenic spots on the South Shore coastline, where you can see small fishing boats, a barrier beach, a sphagnum bog, forested upland, and open meadows. Recreation activities include walking, bird watching, beach combing and sightseeing. In fall and winter, harbor seals can often be seen just off shore. Between 2,500 and 5,000 years ago, prehistoric Native Americans hunted, fished, harvested shellfish and made tools here. Fairhaven is a seaside community on the shore of Buzzards Bay, directly across the harbor from the famed whaling port of New Bedford. Fairhaven has a rich history dating back to the days of the Pilgrims. The first naval battle of the American Revolution was fought by Fairhaven militiamen aboard the sloop Success in May of 1775. The town withstood an attack by the British in 1778 and grew in prosperity during the whaling days in the 1800s. The town's most remarkable features are the magnificent European-style public buildings built between 1885 and 1906 by Standard Oil Company millionaire Henry Huttleston Rogers, a native of the town. Visiting Fairhaven, you'll find a public beach, several recreational marinas, historic Fort Phoenix and the Rogers buildings, a number of unique shops and more than fifty restaurants. From June through September, free historical walking tours are given by the Office of Tourism. Hull is a coastal town that enjoys the offerings of a beach community and close proximity to Boston, which is just a 20-minute water shuttle ride or a 30-minute drive. Located at the end of a peninsula, Hull is surrounded by water, offering many opportunities for boating and swimming and spectacular sunsets over the water. The popular 7-mile long Nantasket Beach has been a popular summer destination for city dwellers since the middle of the 19th century. Lifeguards are on duty from late June to early September. Popular summertime entertainment in Hull includes chowder fests, road races, the Hull Lifesaving Museum, free concerts, and music clubs. A short drive takes you to points of interest in the surrounding towns of Hingham, Cohasset, Scituate, and Marshfield. The South Shore Music Circus in Cohasset and the Marshfield Fair in August attract many summer vacationers. In September, the Hull Yacht Club hosts the annual "Great Chase Race," with more than 100 boats of all types and sizes. It is one of the largest races in the Massachusetts Bay area. Before Kingston became a Boston “bedroom community,” it was something of a tourist mecca. Located on Kingston Bay, this quiet seaside town was a posh resting place for the weary traveler. It also served as the summer destination for many of Harlem's wealthy families. Many of the historic “cottages” along the shore and the Jones River are now vacation rentals. History buffs will enjoy visiting the Major John Bradford House. This house, overlooking the Jones River, was the home of John Bradford, grandson of William Bradford, Pilgrim father. Bradford was one of the leading citizens in the area of Plymouth that was to become Kingston. As with other towns in the Plymouth area, there is a nice selection of beaches nearby and local events, particularly during summer. Manomet is known for its beautiful beaches and spectacular bluffs. But golfers will also appreciate the many golf courses in the surrounding area. Manomet’s restaurants, many with water views, offer up fresh local seafood. The neighboring town of Plymouth is rich in history and its streets lined with antique shops and boutiques, while along the waterfront you’ll find nice restaurants and watering holes. Come to Manomet for your beach vacation but plan on side trips to many interesting nearby destinations. 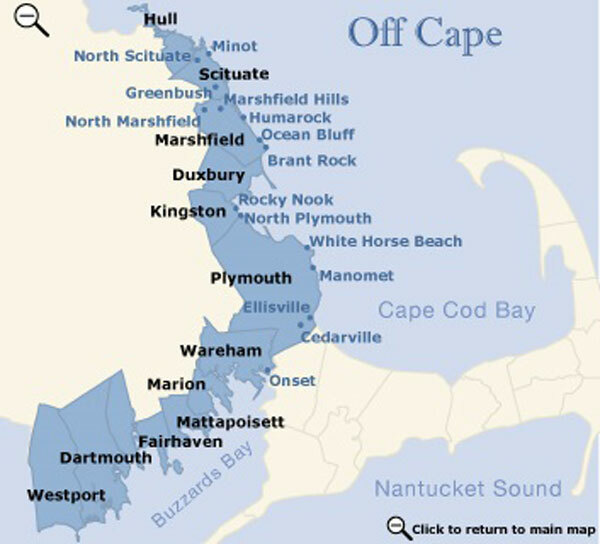 Marion is one of a number of communities that are connected by water, all of which are located across Buzzards Bay western shore of the Cape Cod town of Falmouth. The streets in the village section of Marion are lined with houses that are reminiscent of a time long since past. The New England charm of tree lined streets and white picket fences is evident throughout the village. Marion is also home to Tabor Academy, a well-known preparatory school. The picture perfect campus spreads out across the center of the town. Marion's harbor is one of the prettiest harbors in Buzzards Bay. In the summer the harbor is filled with boats of every size. Buzzards Bay is a boater's paradise, particularly for sailing craft. It is known for its southwest winds that kick up a blow almost every afternoon. Any fog that may appear in the morning usually burns off to a haze, or clears in the afternoon. Onset is situated on another of Buzzards Bay’s picturesque harbors. This tiny (population less than 1,500) town boasts beautiful Victorian buildings and water view dining. Two miles of beaches and two golf courses are nearby. Relax on a harborside bench and watch the boats sail by. At the town pier, Cape Cod Canal cruises, whale watching, fishing charters, and kayaking may be arranged. Onset Village offers many activities throughout the year such as free outdoor movies, blues festivals, plays, firework and Illumination Night in an unspoiled setting. "Tour the Historic Victorian Village of Onset" provides a detailed map and description of historic sites which will lead you on your own walking tour and provide you with a history of many of the spectacular Victorian homes. Most Americans are familiar with the story of the Pilgrims' voyage across the Atlantic aboard the Mayflower, and their landing at Plymouth Rock. Today, Plymouth Rock is just one of the sites that tell the story of Plymouth. Plymouth is a town picturesquely located on Plymouth Bay, about 34 miles southeast of Boston. It is considered “America’s Hometown,” as it was the site of the first permanent European settlement in New England. The Pilgrims founded Plymouth on Dec. 21, 1620, establishing a settlement that became the seat of Plymouth Colony in 1633 and a part of Massachusetts Bay Colony in 1691. Today this historic town is a fishing and tourist center with ship-related industries and cranberry-packing houses. Plymouth Rock is a major tourist attraction, located on the harbor shore under a granite canopy. Also fun to visit are Plimoth Plantation and the Mayflower. Myles Standish State Forest offers more than 16,000 acres for hiking, biking, picnicking, swimming, fishing and canoeing, including 15 miles of bike trails, 20 miles of equestrian trails, 35 miles of recreational vehicle trails and three miles of hiking trails, which take visitors deep into the pine forest. Several ponds are stocked with bass, perch, and pickerel. Plymouth offers a nice choice of nearby beaches. Plymouth Long Beach has a beach house, rest rooms, lifeguard, snack shop, and is frequented by the ever popular ice cream trucks. 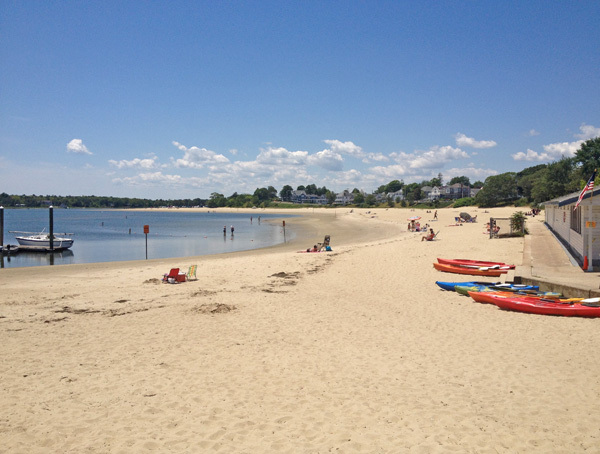 Scusset Beach and Whitehorse Beach are also good choices a short drive away. Squirrel Run Country Club is Plymouth's only public 18 hole executive golf course. With Plymouth's Colonial Lantern Tour, you will explore the town's historic district, the original plantation site, the waterfront, Brewster Gardens, and Town Brook. Project Arts of Plymouth Concerts are held each Wednesday evening along the historic waterfront. You’ll find antique shops and trendy boutiques along with gift and souvenir shops. Enjoy fresh local seafood in one of the many waterfront and water view restaurants or spend the evening in one of the watering holes, all along the harbor’s edge. With all of this, the Town of Plymouth continues to maintain its small town charm and offers visitors from across the globe a chance to experience part of the New England’s early history and seasonal charm. Scituate is a seaside community located 25 miles southeast of Boston. Scituate was founded by settlers from the Plymouth Colony some time before 1634 and many fine examples of early architecture can be found along its picturesque streets. Scituate has long been the summer residence of Bostonians seeking relief from summer’s heat. Chances are you’ll find a lovely cottage with a huge porch and rocking chairs overlooking the water. There are miles of beautiful beaches and plenty of opportunities to enjoy water sports. You’ll also find nice shops and all types of dining experiences. Scituate Lighthouse, built of granite in 1811, is worth a visit and can be toured by contacting the Scituate Historical Society. Wareham is situated at the head of Buzzards Bay, and considered the “Gateway to Cape Cod." Its early beginnings were that of a farming and ship building community in the 1700's. All of the tourist amenities of Cape Cod are available in Wareham. The town has over 54 miles of coastline enhanced by beaches, estuaries, rivers and ponds, perfect for canoeing or kayaking. There are antique shops, art galleries, outlet shops, and gift shops. You can cruise the Cape Cod Canal or enjoy the paved paths along both shores of the canal, which are wonderful for walking, biking, skating or just sitting and watching the ships pass through. Wareham offers plenty of dining experiences. The "Water Whizz" water park is a family favorite and there is a beautiful public golf course, "Little Harbor." Wareham is a great destination for its fishing, swimming, and sailing – or just relaxing – and its proximity to Cape Cod for day tripping.